Hey Days is coming up soon! The library will close at 5 p.m. on Thursday, May 16. We will be open regular hours on Friday. We will be closed Saturday, May 18. 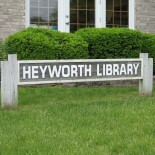 Since 1941, Heyworth has been proud of its library. Through the years the library has expanded in size, people served, and services offered. In 1989 construction was completed on the current library building.